Recipe 104:I love veal and this is one of the meat dishes i love the most, so it needed to stay in my Birthday dinner menu. It’s a bit expensive in London to buy veal but is really something you need to try. Ingredients: if you don’t cook this dish alone but you will serve it with a starter or something else, i would suggest you to calculate about 100gr of veal for each one of you, a packet of fresh sage, a packet of parma ham (around 10 slices), oil, butter, a bit of white wine, salt and pepper. And don’t forget the toothpick! In first place you will need to prepare the meat: cut it in little pieces and put some parma ham and sage on top. All this will be fixed by the toothpick. In a pan put some oil and butter and the meat. When this starts to fried a bit, add some white wine and wait. In the meantime i prepare some poteto in the oven and some pies with onion. Turn the pieces of meat when they start to be colorful and put some salt and pepper just to add more taste. Now you are ready to serve them. This recipe as well is super easy to do… so are you starting it? PS. Mamy i saltimbocca non si battono, belli croccanti e saporiti. Io c’ho messo il prosciutto crudo invece dello speack perche nei supermercati non si trova facile, ma con lo speck magari sarebbe stato pure meglio.Invece Francesca mi ha aiutato cone le patate: in due secondi me le ha pulite tagliate e messe a forno!!! se non ci fosse lei bisognerebbe inventarla. Recipe 105: And also this year my birthday arrived…and this needed to be a special TILT birthday, so i decided to cook my favorite dishes all in one dinner! I started the preparation the night before with the cakes because i wanted to bring one at work and i wanted to have a double choice in my dinner…so finally i cooked 3 cakes: 2 ciambelloni with apples and 1 double color ciambellone. Ingredients for one cake: 3 eggs, 150 gr sugar, 300gr flour, 80-100 gr butter, 1 glass of milk, some baking powder, and add 2 big appleas and some cinnamon if you want an apple cake or some chocolate if you want a double color one. Finally i bought some colorful sugar to finish the cakes…exactly like my mum use to do it when i was in primary school. Mix the 3 entire eggs with sugar until create a cream, then add some of the flour and mix again. Put the butter on the fire and when melted add it to the cake. Add the rest of the flour and mix again until becomes very hard. At the end add the milk with the baking powder and keep on mixing. Then cut the apples in very little pieces and just put it with the rest. The cake is all here, very simple and quick, but everyone will like it. Now put some butter in all the mold and pass then some flour in it. Like thsi the cake won’t stick to the mold. Then put the mix inside and cover the cake with some funny and colorful sugar sprinkle. Put in the oven for one hour at 180 degree. Don’t check the cake before than 1/2 an hour at least or it won’t grow up anymore. Open the oven just when you think they already grew up enough. The easy alternative to this cake is with chocolate. Put some of the mix just prepared,in a little mold and add to the rest of the mixsome chocolate in pouder. Before to add to the rest the chocolate mix, I also put some little pieces of chocolate inside and i covered it with the rest. The last touch will be the chocolate sprinkles on top. This is the final results of the cakes i had at home, and the following one is the cake i did to bring it at work! They exactly look like my mum’s cakes! PS. : ciao mamy, che ne pensi? E’ bella come quella che mi facevi tu alle elementari??? ?io direi che ci sono andata vicino, ma la prossima volta devo controllare meglio la cottura. Vabbe per il momento mi accontento! Le due piccole sono quelle che ho fatto per la casa, mentre la grande e’ quella per l’ufficio. Recipe 106: Finally i did it!!! i bought two nice fishes, i cooked them in the oven and i was super happy!! I have never done it before just because i was really scared to have to clean the fishes inside, but yesterday i couldn’t stop myself: when i saw this two salmon trouts in the supermarket i had to buy them and try to cook them in my mum way. The ingredients are really few but the taste is very good. For 2 people buy 2 fishes (i choose the salmon trouts but it could be whatever else), potatoes, bread crumbs, parsley, lemon, oil, salt and pepper. Nothing more! Wash the parsley and cut it in very thin pieces (15-30 leaves for person depending also by the size of the fish) then add two spones of bread crumbs for person and some salt, oil and lemon following your taste. Mix it all until it takes the consistency of a dough. In the meantime cut the potatoes in very thin slices and display them in the oven tray. Add some oil, salt and pepper. Wash the fishes (thanks God you can find them already clean in Tesco) and take off what is remaining of the interiors. Put them on the potatoes and stuff them with the mix you prepared before! add some other oil, salt and pepper on the fishes and place in the oven for 40-45 minute at 180 degrees. As you can see the recipe is very easy and the secret is all in the tasty mix we did at the beginning! 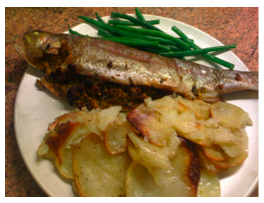 The potatoes were perfect, the fish cooked and exactly how i remembered from my mum! I loved it! PS: Mamy hai visto che alla fine l’ho cucinato? Ho preso coraggio, ho visto che il pesce aveva un bel taglio ed ho sperato fosse bello pulito. Cosi e’ stato, e la salsina m’e’ venuta anche abbastanza bene!Che buono, ma ti pare che in un’isola io mi devo sognare il pesce come un cibo proibito??? Recipe 107: With this cold it’s just the right time for this classic italian dish… and it was months i was waiting to cook it. My italian friend here in London too was waiting for it since a long time and this was the perfect week. The ingredients for this cheap but very tasty typical winter italian dish for 4 people are: 1 carrot, 1 celery, 1 onion, fresh rosemary, 2 pieces of garlic, 420 gr Borlotti beans (i took the ones in cans with water Cirio from Waitrose), 1 vegetable stock, 140 gr pancetta, pepper, salt, chilli, 340 gr short pasta (i used the chifferi rigati De Cecco from Waitrose). There are thousand of different recipes for this dish in Italy, but this is the one my mum pass me. This is a middle way between a pasta and a soup and it’s a very fulfilling dish that can be eaten also as a one dish meal. Start putting in a pan with some olive oil the carrot, garlic, onion, some fresh rosemary and celery cut in really little pieces. Let them cook and in the meantime put the vegetable stock in some boiling water to create the brodo. In another saucepan put half of the beans without their water or already boiled if you bought the dry beans. Smash the other half with a fork and add them to the rest with a bit of brodo. Let this cook on a low fire. After that add to the carrots, celery, onion and garlic all the pancetta and let it cook. When ready you can mix all this to the beans with another bit of brodo and some chilli, pepper and salt. Everything will cook and mix, creating a nice thick soup. At this point you can add the pasta to the soup and cook it for the time written on the bag and don’t forget to taste it to know if it’s the case to put some other salt too. If you want the dish a bit more liquid and similar o a real soup, add more water or stock water, otherwise leave it like this and just let it cook. To make it even more thick, you can cook the pasta a bit lees than what is suggested and leave it to rest an hour before to serve it. everything in this case depends by your taste. Now the dish is ready and you can serve the pasta with a bit of olive oil on top and black papper. If you want you can of course add some Parmesan but we use more oil and pepper than this for the Pasta e fagioli. PS: Mamy non sai che buona questa pasta e fagioli!!!! e non ti immagini quanto ci stava bene con il freddo che faceva fuori!! Anna s’e’ leccata i baffi. L’ho fatta magari un po’ troppo asciutta, ma che soddisfazione e che sapore! questi si sono i piatti che proprio mi mancano! Recipe 108: if tonight you have guests and you still don’t know what to do as an easy starter, try this recipe, quick, tasty and vegetarian so good for everyone! 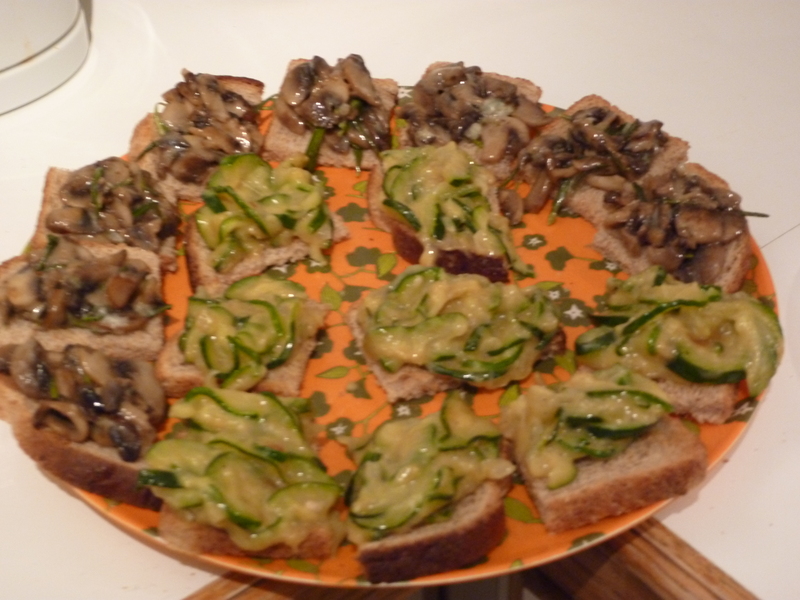 Ingredients: bread (i used 4 slices of brown bread) – 1 courgette – 1 little onion – 70/100 gr Camembert cheese – 70/100 gr gorgonzola – 100/150gr.mushrooms – fresh rosemary – olive oil – salt – a piece of garlic and a bit of chilli. Let’s start from the courgette: cut it in very thin slices and then again in half. Place them in a pan with some Olive oil and an onion cut in little pieces and let everything cook. Add then some salt and chilli and when the courgette start to get mild and colored, add the cheese in pieces until it melts all. In the same time wash and cut some mushrooms and put in a pan some oil and pieces of garlic. Let this cook a bit and then take it off from the oil. Add then the mushroom, salt and some fresh Rosemery and let cook. When the mushroom are cooked you can add some Gorgonzola cheese and let it melt. Now just toast some bread, cut it in little squared pieces and put some butter and the 2 different vegetarian mixes on top. As you can see it’s very easy and quick, but i think the right selection of cheeses and vegetables just creates a very good starter. PS: Mamy l’altro giorno non sapevo che inventarmi per offrire un aperitivo cosi’, guardando in frigo il cibo a disposizione, ho creato questi due accoppiamenti di verdura e formaggio che penso stiano proprio bene. Niente di speciale a vedersi ma molto meglio delle solite patatine fritte! It’s definitely winter here in London and with the grey sky and the snow we had last weekend, what i was just dreaming about was a nice hot place where stay in piece, having some treat and looking at the snow outside of the window…the perfect place was the Nordic Bakery. This is a lovely little scandinavian coffee in Golden Square, near Piccadilly, very famous for its typical products and especially for the dark bread and cinnamon buns! With a cup of coffee or a finnish bear you can’t ask more! The place is always full of people but is magically quite and relaxing. In the air there is smell of sweet things and all around the colors of the walls, of the cups and plates it’s all made to make you in a good mood and to enjoy the food and coffee in the best way. I love everything in this place. I could stay there for hours. And if you go there please try the buns but also the amazing Karelian pies, the last in the previous pictures. They are rye crusted savoury snack with rice or potato filling. They are served with egg-butter and i can eat 10 of them, one after the other. PS. Mamy, tanto perche’ continua a nevicare e bisogna stare al caldo l’altra settimana ci siamo andati a fare uno spuntino in una nuova caffetteria che ho scoperto. E’ una caffetteria scandinava…bellissima e tranquillissima che vende prodotti tipici e che fa dei bei caffe. Le cose piu’ buone sono questi dolci alla cannella che vedi sopra e queste strane tortine salate ripiete di riso o pure’ che mi sono piaciute tantissimo! Non si finisce mai discoprire nuove cucine e culture! Recipe 109: and now an easy cake to make and have for breakfast with a nice cup of hot milk, coffee or chocolate or as i did in my last dinner, i served as a dessert with some vanilla ice cream. The ingredients for this are: 1 cup of yogurt (125gr) – 3eggs – 1 cup of sugar (around 100gr) – 3 cups flour (around 200-250gr) – 1 full little spoon of baking powder – 1cup of sunflower or arachis oil – a pinch of salt – some icing sugar and some milk. Because i decided to use strawberry yogurt instead of plain yogurt i also bought some vanilla ice cream and fresh strawberries to serve it to my guests. Start mixing the 3 egg yolks with the sugar and the pinch of salt until you will have a cream. Then, still mixing, add slowly a cup of oil and then the 3 cups of flour always slowly and trying to avoid clots. At this point the mix will be quite hard and you will need to add the yogurt and some milk if it’s still not enough liquid. The last touch will be to whisk the egg whites until stiff and add them slowly to the mix being very careful. Finally you can put everything in some nice silicon moulds (like the one i received for Christmas) or in a classic baking pan at 180 degree for about 30 minutes. Don’t forget to add some icing sugar on the top or even ice cream and strawberries “marinated” at the beginning of the night with some orange juice or lemon if you prefer. They will release the juice and the taste will be just perfect! PS. Mamy hai visto che carine le tortine che ho creato con le formine che mi avete regalato?Avevo voglia di servire un dessert facile e questa ricetta con lo yogurt ci stava benissimo. Il vero ciambellone me lo tengo per la mia festa! vedrai vedrai ….